There is an ebb and flow in adding to my PLN. Depending on a project or a research strand a certain topic may rise to the top of the reading list. 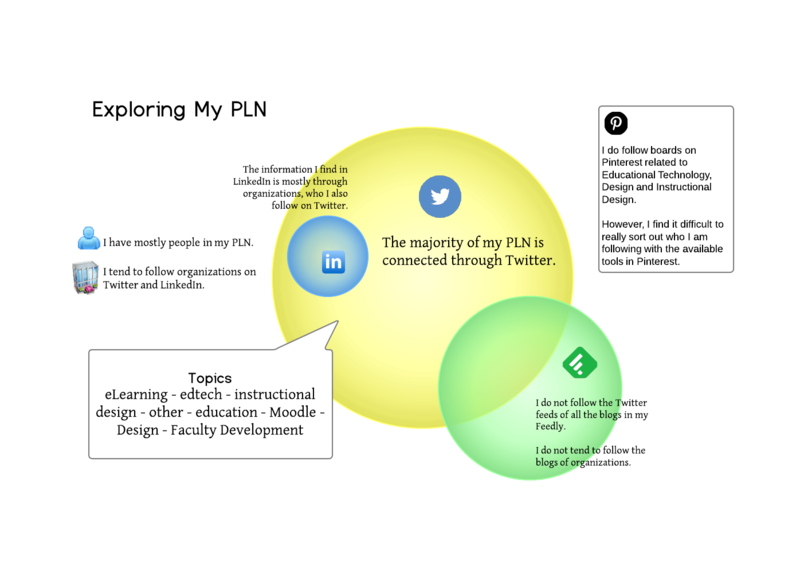 I took a look at my PLN and discovered some things about how I access information. There was no scientific analysis of the data. I was simply looking for trends and patterns. I will admit that my access in Feedly has not been as frequent, as I have been reading more research. As such, I probably should have included Mendeley. As I looked over the people, organizations and businesses I thought about how they came to be in my PLN. Here are some stories…. Several people I met virtually, in an online class, or a webinar. I’ve added these people because I connected with them in a different virtual space, and although the class or meeting is over, I wanted to continue that connection. Several people I met in person, often at conferences. We shared our social media information and I continue to watch what they are sharing. Many of the people in my PLN I have never “met.” Rather I saw a connection, or one of the people I already followed shared an insight from this person and I decided to add them directly to my PLN. Joining an organization can strengthen connections you have already made virtually. When I attended the AECT conference in Fall 2013, I discovered that the people I had found online and added to my PLN were also at this conference. It confirmed to me that I had joined the right organization. Do You Need to Constantly Build? I would say no. Even as I explored my PLN, I noticed that there are some feeds that don’t really grab my attention. I discovered some dead RSS feeds that needed to be deleted. There is no way to read absolutely everything, but if you take time to find people that share information you need or are interested in, it can help you continue to learn and grow as a professional.